"You have gathered to be encouraged, to be inspired, to be lifted and directed as members of the Church. We are all assembled together as believers in this, the cause of Christ. Each of us is His servant in building His kingdom in anticipation of the time when He will come as King of Kings and Lord of Lords. You have gathered to be helped with your temporal concerns, your failures, and your victories. You have come to hear the word of the Lord taught by those who, not of their own choosing, have been called as teachers in this great work. "I invite you to listen, listen if you will by the power of the Spirit, to the speakers who will address you today and tomorrow as well as this evening. If you will do so, I do not hesitate to promise that you will be uplifted, your resolution to do what is right will be stronger, you will find solutions to your problems and your needs, and you will be led to thank the Lord for what you have heard." President Hinckley participated in General Conference as a Church leader for some 47 years. That's almost 100 conference weekends! In some ways though, his personal experience was likely not all that different from any of ours; he felt the same kind of challenges that he listed as things we all seek: help with temporal concerns, failures, and victories. 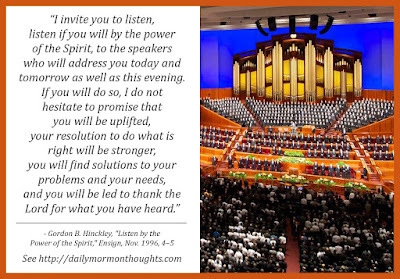 Faithful, seeking Church members will approach conference prayerfully, eager to hear counsel that will "help you with your problems and add strength to your faith." 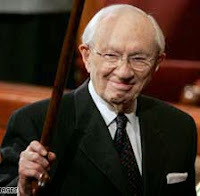 But President Hinckley responds that those who share the instruction have also been praying most earnestly for guidance on what to say and how to say it. Those two directions of desire facilitate the blessing of spiritual communication that brings power to the assembly. That is a "challenge with a promise"—an invitation to listen with sincere desire, and the promise that blessings will follow. I hope we are all eager to accept that invitation and then participate in the results!